Wayside Shrine boxes located at Archbold Biological Station contain information collected by scientists about the plant it features. 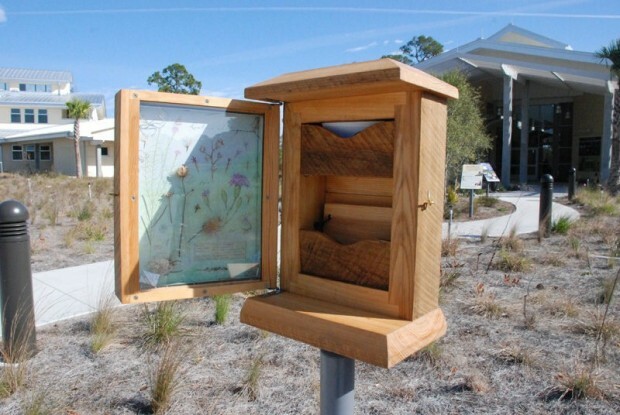 VENUS — South Florida Community College’s Museum of Florida Art and Culture recently unveiled three new Wildflower Wayside Shrine boxes at Archbold Biological Station’s new education center. Each shrine box is dedicated to an endemic or endangered plant species found on the Lake Wales Ridge. The boxes were created by MOFAC curator Mollie Doctrow after she learned about the scrub habitat located on SFCC’s Highlands Campus. Scientists at Archbold Biological Station partnered with Doctrow and MOFAC to create the boxes to provide scientific assistance in identifying different species located along the trail at SFCC. “This project has been educational for us, too,” Hillary Swain, Archbold’s director, said in a news release. The MOFAC exhibition “Celebrating the Lake Wales Ridge” is ongoing at Archbold Biological Station and features the flora and fauna of the Lake Wales Ridge by artists including Doctrow, Reed Bowman, David Price, John Moran, Mark Deyrup and Carlton Ward Jr.
“We hope this partnership can help bring new visitors to each location,” said Doctrow. “Perhaps those people who visit SFCC MOFAC for art will now visit Archbold Biological Station, and those who visit the station for science and nature will now visit MOFAC,” she said. The public may visit Archbold’s education center during prescheduled tours. For dates and times, call 465-2571. The self-guided Wildflower Wayside Shrine Trail at SFCC is open to the public during college operating hours.